Have you ever experienced a cramp, a muscle pull or a displaced bone while playing? If yes, then you must be fully aware of the crises you must have gone through at that moment. The pain you had experienced back then must have aggravated at the point when you got to realize that you are no more in a position to play your favorite sport ever again. It is a total heart ache, when you are injured while you are playing as even the winning turns into a painful affair. To handle you through such a situation we at Delhi Physio have made an excellent mark in the field of providing physical therapy and courses for sports injuries. Our learnt therapists engage in providing suggestions and treatments related to rehabilitation of the various injuries, diseases and disorders. Sports Physiotherapy as the name suggests is a specialized field of Physiotherapy that deals with injuries and issues related to sports professionals. Our experts not only conduct research and have a deep understanding of the areas of problems but they also help in the process of recovery coupled by providing education and resources to prevent problems. 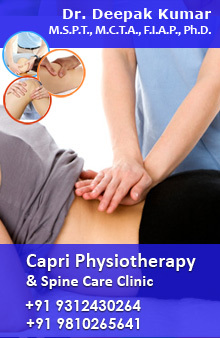 Delhi Physio provides therapies to people of all age groups involved in sports at any level of competition. Our physicians and trainers who are practicing sport s therapy have ample information about the injuries suffered by sports professionals. The treatment begins with the face to face session with the injured; the discussion gives a complete understanding of the problem which gives way to the best rehabilitation plan to start with the course. We, at Delhi Physio carry out physical therapy sessions not only to overcome the pains and injuries but our main aim is to help the injured regain his strength and confidence in the sports ground. Our therapists stay regular with the routine checkups to evaluate the progress and also provide the patient with advises and precautions so as to avoid such injuries in the near future. We strongly believe that the treatment provided by us can uplift the spirit of the sports person and bring him/her back in the game.